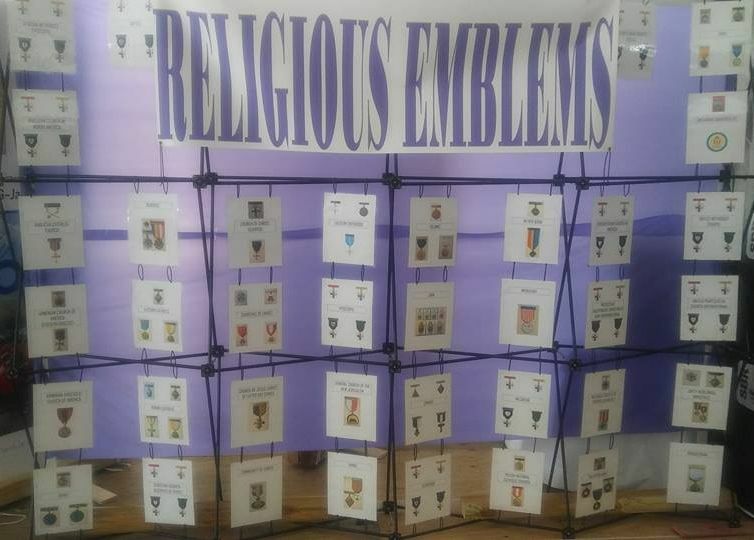 The National Religious Relationships Committee hosted the Duty to God and Country Tent with expansive displays of the religious emblems available to Scouts and Scouters and booths from the various national religious committees. P.R.A.Y. was invited to be a part of this experience, and CEO Jason Noland served as staff and lived in camp for 2 weeks to help provide a quality experience for Scouts visiting the Duty to God and Country tent. Of great value was the opportunity to strengthen relationships with P.R.A.Y.’s friends and partners in ministry. Jason posted pictures of many of the groups on Facebook . For a complete listing of the groups that help connect Scouting with the faith community, visit BSA's page on " Religious Chartered Organizations ." Duty to God was not only showcased in the elaborate displays and exhibits of religious emblems, indeed the greater display - according to Jason - was the interfaith spirit and reverence demonstrated by the Scouts and Scouters themselves. Impressive were the Four Star candidates and their commitment to completing the religious emblems requirements at every level. Impressive were the number of adults and Religious Emblems Coordinators with a passion to learn about and promote Duty to God. But how moving it was to see the impromptu and genuine outpouring of care toward fellow Scouts … the number of Scouts who were taught how to tie a traditional Sikh turban (and who received a free turban) returning to the Sikh booth to give back their free turban after learning that supplies had run out … the staff from the Jewish Committee coming together and gathering other Jewish Scouts to surround the lone Scout from North Carolina and celebrate his bar mitzvah (something he never had living in isolation from any Jewish community back home) … the crowds gathered in the rain to worship and show reverence together. As Jason explains, "These are the true pictures of Duty to God in action."  CALLING ALL RELIGIOUS EMBLEMS COORDINATORS! As REC’s, you already know that religious emblems programs will benefit Scouts, their families, and the Scout unit itself. You know that Scouts involved in the Religious Emblems Program of their faith will grow spiritually and remain in Scouting longer, and that in turn, they will likely progress further down the advancement trail and gain other valuable life skills in the process. But do your Scouting families know this? 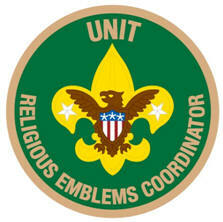 Every unit should have a Unit Religious Emblems Coordinator. It’s time to recruit Unit REC’s to ensure that Duty to God is built into the Scouting experience. 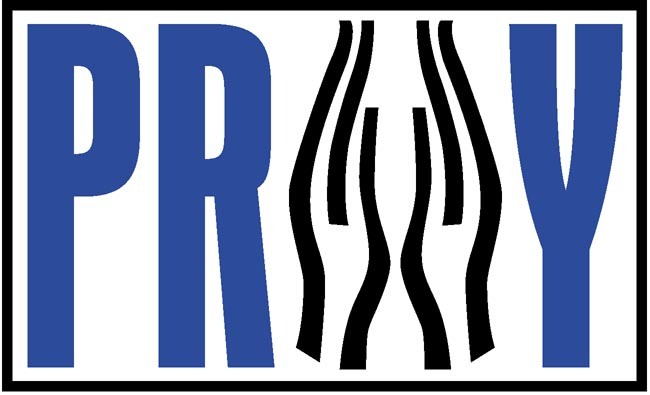 Share P.R.A.Y.’s REC page with potential recruits and start multiplying our efforts. Find an inspirational story to share on our spotlight page or share your own story. 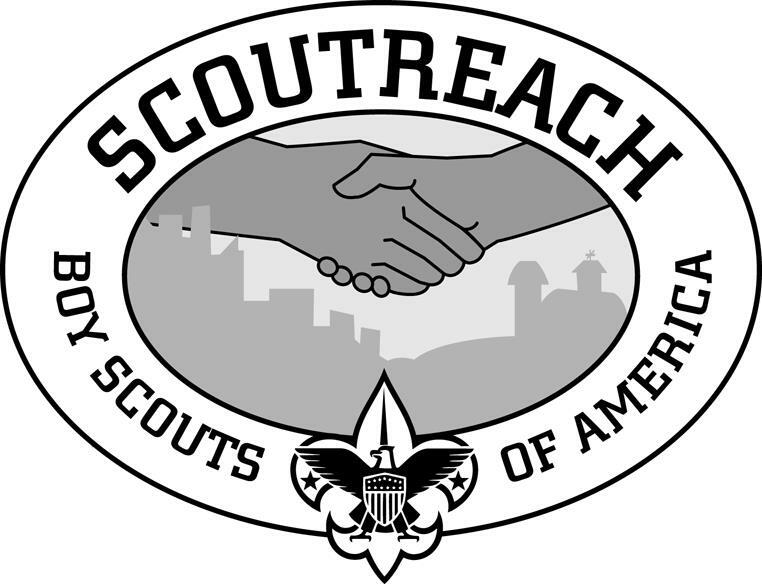 “Breaking Barriers” is part of the Scoutreach program at Jayhawk Area Council and their commitment to ensure that all young men have an opportunity to join Scouting, regardless of their circumstances. 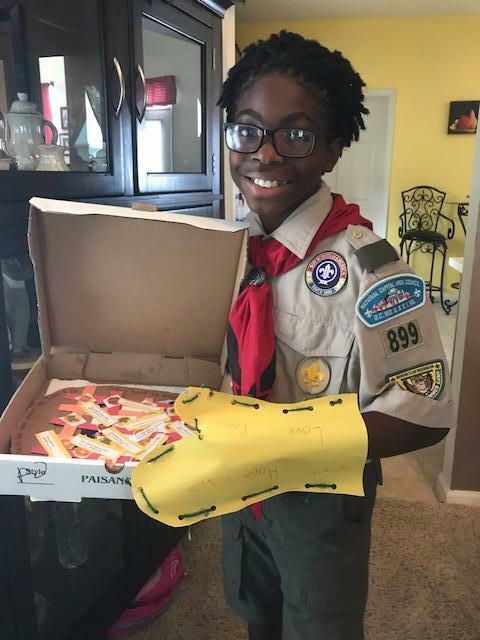 Breaking Barriers is a special program that works with a local women’s correctional facility to bring Scouting to boys and young men whose mothers are incarcerated. Mark Dechand, a BSA volunteer who helped start Breaking Barriers years ago, explains that “the goal of Breaking Barriers is to establish an environment where the inmates can have a positive relationship with their children, and where the Scouts can have fun and advance in Scouting.” Each month they coordinate two planning meetings with the women which culminate in a 7 hour retreat with their Scouts. The retreat is a combination of a Den Meeting, Cub Scout Meeting and Venture Crew meeting (there are no Boy Scout age youth right now) along with meal preparation and service projects to others. Breaking Barriers exists to help boys and young men develop skills and self-confidence. 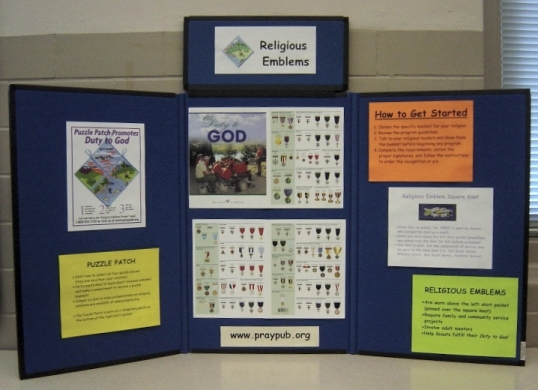 Thank you for including the religious emblems program and helping them also grow in their Duty to God. 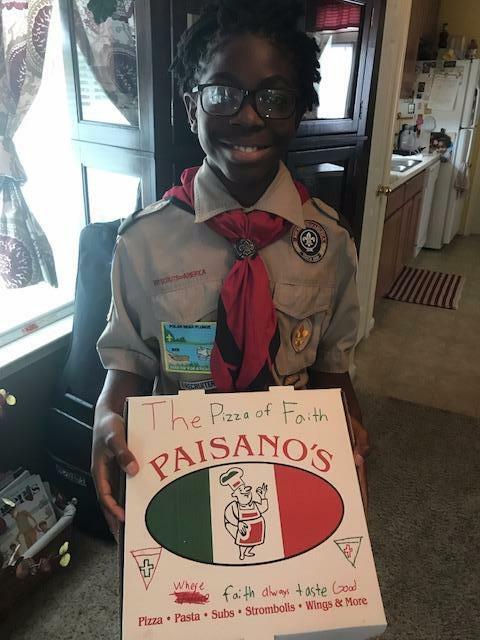 M.J. completed the God and Family requirements and proudly displays his “Pizza of Faith” with the slogan “Where Faith Always Tastes Good.” M.J. is a member of Troop 899 in Lorton, VA. He attends Deliverance Outreach Temple, a nondenominational congregation. Submit your own story via our Spotlight submission page.